It doesn't matter who you are there are days when you do not have time to make dinner. When we are that busy we usually end up eating things that are not that good for us or we go out. 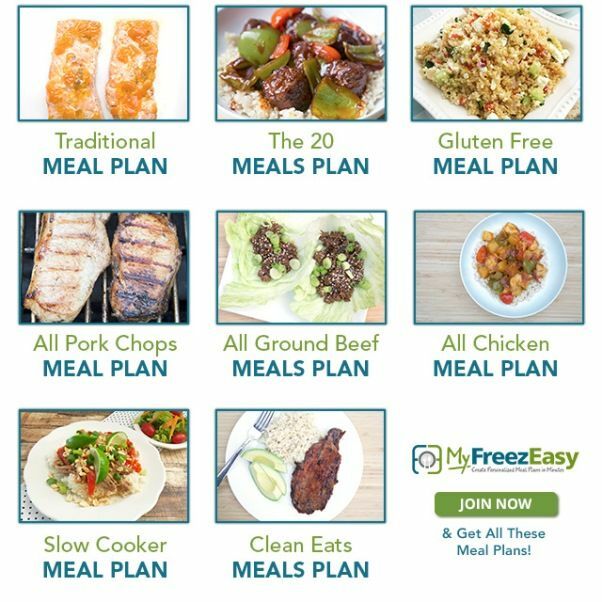 A great way to avoid that is by using the MyFreezEasy meal plans, and with access to the MyFreezEasy.com Freezer Meal Plan Membership there is so much to choose from. Once you have a plan selected and if you are happy with each recipe you can print out everything you need from one place. Once you hit print you will have the recipes, shopping lists, and assembly of the meals all in one place. Each recipe shows the ingredients and cooking instructions for a single meal and the assemble prep direction for two meals. 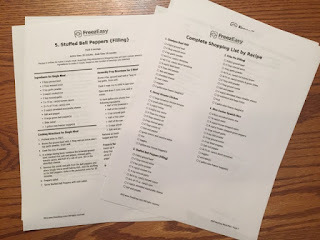 There is a shopping list for each recipe and there is one that is divided up by store categories. Lastly there are instructions for any pre-cooking and chopping instructions and the assembly instructions. There are also labels that you can print to attach to each recipe. They include the recipe name and cooking instructions. If there are recipes you would like to swap in your meal plan you can pick them up in the small box at the right and move them to the big box on the left. Then you can do the opposite with recipes you want to add to the meal plan. Drag them from the left side to the small box on the side. You will do the same thing if you create your own menu plan. The recipes are listed to serve 4, but before you print or save the instructions for your menu you can change the serving size to 2, 6, or 8 servings. If you decide to create your own meal plan you can choose from different categories. The recipes are divided by meat, cooking method, or special diet. Some of the recipes are included in more than one category. The meal plans do not contain any sides you may want to add to your meal. This Month's Meal Assembly Video is about an hour long and Erin shows you how to prepare and assemble the recipes for this month. If you chose to make a specialized meal plan there are shorter video segments for each individual meal plan with highlights specifically for that menu. There are a lot of recipes to choose from, so even if you have picky eaters you can find something everyone will like. There are recipes for macaroni, chicken, fish, crock pot meals, oriental dishes, Mexican recipes, and more. Most of the recipes are stored in the freezer in gallon baggies, but there are some that use disposable 9X13 pans. My 11 year old daughter Alaina was having the most fun with this. She loves selecting recipes that she wants to make. She didn't have any problems adding and removing the recipes from the MyFreezEasy Meal Plan Box. I love that the shopping list is printed by store categories. It makes it very easy to see what we need to purchase and to shop once we get there. Preparing the recipes actually took us longer than an hour, but that is because Alaina was helping. I'm pretty sure I could get them all done in that amount of time. 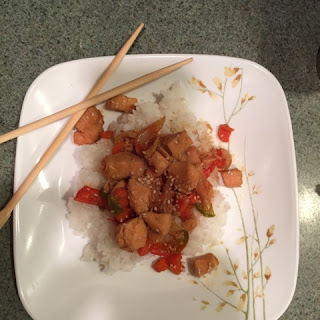 My whole family has liked everything that we have made so far and the Honey Sesame Chicken has been the over all favorite. It is so nice having dinners in the freezer that need very little time to cook. I love being able to choose recipes by meat type. We buy a whole cow once a year, so we always have beef on hand. We also like chicken, so it's great to know exactly how much chicken we need to buy to get use through the next time we shop. Erin Chase started MyFreezEasy. She does all the planning, prepares the menus, and records all the videos. This is designed to make meal preparation quick and simple. With that being said she uses a lot of prepackaged items. She uses canned beans, canned sauces, and precooked chicken. I do not normally shop and cook this way, I try to make everything from scratch that is possible. 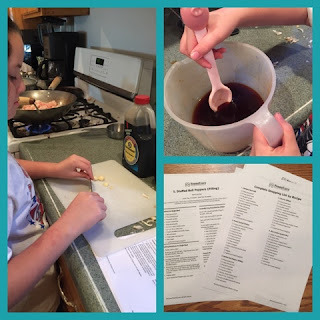 It is easy to adapt her recipes to fit our life style, but it does take a little longer. It has been nice having this this time of year, because I have been canning so many things from our garden and it's nice to just be able to pull dinner out of the freezer and have it ready even though I have a mess in the kitchen with other things. No matter what your lifestyle is like or how much you like cooking you can follow these recipes and these meal plans. 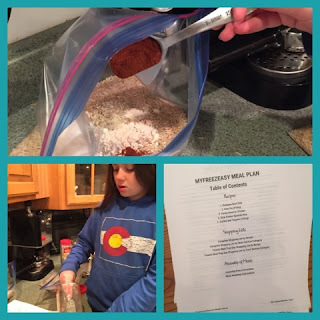 My 11 year old has been planning our meals for the last month and it has added a variety to what we normally eat.